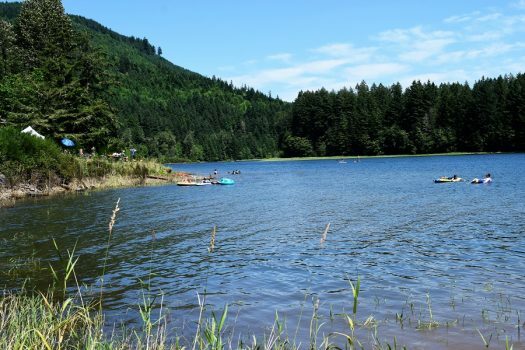 Fall Creek Lake's proximity to Eugene has made the lake a popular recreation site on hot summer days. There are four free day-use sites on the northern side of the Fall Creek Lake. Great spots for summer fun including swimming, picnicking, fishing, and boating, Lakeside 1 and 2 Day Use Sites are located 0.4 miles of each other and approximately 6 miles east of the Fall Creek Dam. Fall Creek Lake water is warmer than in the creek. You are free to spend all your day swimming but if it’s too crowded, you can find a free hole along the 14-mile-long Fall Creek National Recreation Trail. 90 miles southeast of Salem. Bear to the left after passing Winberry Creek Road and follow for about 8 miles to Lakeside I on the right (head east for 0.4 miles to Lakeside II ).